Rich Dad, Poor Dad author Robert Kiyosaki says relationships – and knowing when to move on from them – are the most important things for any entrepreneur. Relationships are the most important thing for any entrepreneur, according to Robert Kiyoaski, author of the best-selling Rich Dad Poor Dad series of books, because every business person needs key suppliers like lawyers, accountants and a mentor, not to mention people who can do the things in a business that a founder and visionary cannot. But entrepreneurs can outgrow those people he warned when he spoke to My Business in Sydney and outlined the methodologies in a new book he co-wrote with Donald Trump, Midas Touch: Why Some Entrepreneurs Get Rich-And Why Most Don't. The ability to attract finance, which Kiyosaki says is a consequence of achieving the three items above. Midas Touch says entrepreneurs can achieve these four things using a model that assigns a value to each of the five fingers. “Your thumb stands for strength of character,” Kiyosaki told My Business. “When you go into business you are on the streets” and character is critical to thrive in the face of adversity. The little finger, he concluded, is “the little thing you do that no-one else does” and Kiyosaki said FedEx’s overnight delivery guarantee is an example of a unique offer that other entrepreneurs will do well to emulate. As our conversation progressed, Kiyosaki repeatedly stressed the importance of relationships. Kiyosaki says his relationship with Trump works along those lines. “I feel fortunate that when I have a question I call Donald and ask,” he said. 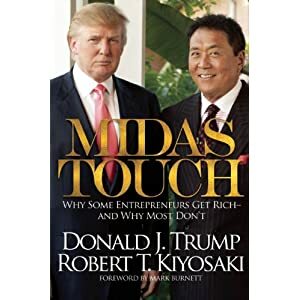 For those of you who don’t have The Donald’s number in your mobile, Kiyosaki said you should at least be thinking about the need to one day upgrade your mentor – and the advisers to your business – to a Trump-grade source of support.